A little giant the SB1 Smart Badge from Zebra is capable of big things, so do not be fooled by its compact size. It is a practical universal tool for sales personnel and other employees in retail. Use the 3 E Ink Pearl touch display to call up and process personal task lists - even while wearing gloves. It is perfectly readable independent of the surrounding lighting, and when in badge mode, the SB1 serves as a digital business card. Thanks to its integrated 2D barcode reader users are able to perform price queries and real-time stock quantity checks. Connection for data and voice transmission occur standard via the integrated 802.11 b/g/n Wi-Fi. 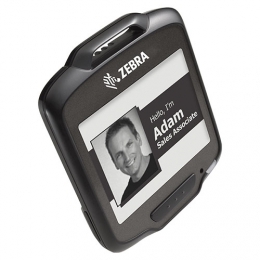 With push-to-talk all employees with Zebra mobile devices can communicate with each other. A full shifts work is more than guaranteed by a battery life of 14 hours recharge it quickly in less than four hours. The housing of the SB1 offers IP54 class protection against foreign particles and liquids, plus it withstands drops from 1.2 m. Thanks to its compact form and light weight of 110 g carry it comfortably with you.